25 blouse sleeves designs every bride needs to check out before going to the tailor! If you are looking out for blouse sleeves designs that you can show your tailor for inspiration, then you have stopped by just at the right place! If there is anything apart from blouse neck designs that catches the most attention, it is the blouse sleeves. And that’s why I have picked the 20 best blouse sleeves design patterns for you to pin to your bridal board. 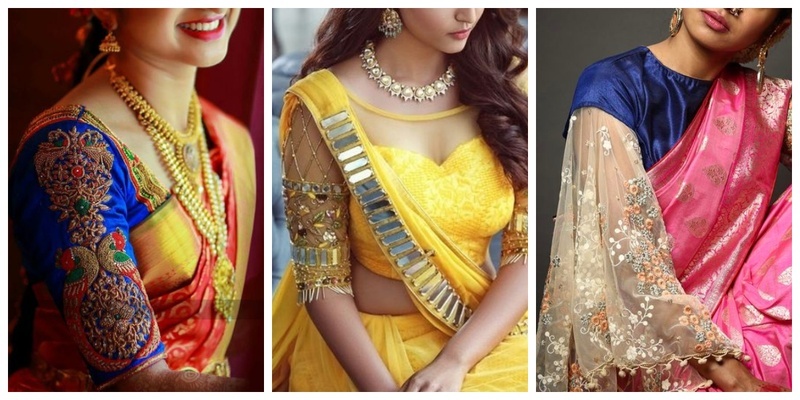 Or if you haven’t even decided on what kind of wedding blouse design you are going to wear, then check out these latest saree blouse designs for major wedding wear inspiration. Here’s an offbeat blouse sleeves design that you can pull off with a silk saree! The sheer cape sleeves with floral embroidery are a total contrast to the silk, making it look ultra chic and modern! If you are planning to wear a maggam work blouse with pattu saree on your big day, then you can surely consider getting this heavy work done on your blouse sleeve. The cold shoulder blouse sleeves design along with latkan and temple motifs and embroidery is just too beautiful to miss! This new blouse sleeves design with sequence and cutdana work is a stunner to wear with a designer saree for your reception. The fairy feathers and 3D flowers detailing on the shoulder just add to the charm of this blouse sleeves design. If statement blouse sleeves designs are something that you wish to wear on your big day, then this voluminous blouse sleeve is just what you need to see. Tip: Such blouses can be easily made with brocade fabric and worn with silk sarees! If you are not the one to shy from trying new and quirky blouse sleeves designs, then this voluminous full sleeve frill and embroidery blouse is something you should totally give a try. Tip: You can use this blouse sleeve pattern for your cocktail or mehendi lehenga as well. Check out more hatke blouse designs here! This stunner of a blouse sleeves design is nothing less of a ‘modern-meets-traditional.’ The chunky mirror work with chrome detailing on the sleeves makes this blouse a great option to wear with net or chiffon sarees! If you want an embroidered blouse sleeves design, but don’t want to go all out with maggam work, then you can choose to design your blouse with intricate thread embroidery on the sleeves with minimalistic bead embelishment near the hem. Zardosi is that one style of embroidery that has made its mark in bridal wear. If you too are a fan of this embroidery style, then this blouse sleeves design with gracious peacock motifs is something you can choose to wear on your big day. Nothing beats the beauty of gold floral embroidery of a red blouse, does it? This blouse sleeves design with delicate flowers, gold bands and dainty motifs make it look super gorgeous! This blouse sleeves design on brocade with heavy gold embroidery is a stunning choice to wear with a plain silk saree! This elegant bird motif blouse sleeve design on the white fabric is a stunning choice to wear with a multicolour lehenga or a pastel chiffon saree! Perfect for an engagement or pre-wedding ceremony. This multi-layer frill and bell sleeves blouse design is a trendy and adorable option to wear with your sangeet lehenga. You can even make the sleeves shorter if you don’t prefer wearing long sleeves. When it comes to festive motifs, peacocks are the most loved motif. This latest blouse sleeves design with multi-colour peacock motifs is one such piece you can wear with your wedding pattu saree! This full sleeves blouse design with an elegant floral motif is a great idea to wear with a heavily embellished lehenga or a graceful organza saree! Perfect for a daytime pre-wedding ceremony, I say! Why wear a separate bajhu bandh when you can stitch it on to you blouse sleeves design? Why should gota patti be limited to lehengas only, right? If you too are majorly crushing over this embroidery style, then a blouse sleeves design with stunning gota work will go a long way when it comes to pairing with different kinds of sarees. This raw silk blouse sleeve with statement band embroidery is a simple yet stunning example of how you don’t have to go overboard with your blouse sleeves designs to make it stand out! The combo of off-white and gold is heaven made. And this blouse sleeves design pattern with heavy gold thread work embroidery is a complete stunner to wear with a kasavu or kanjivaram saree. The cold shoulder blouse sleeves design is not going out of fashion anytime soon! If you too want a cold shoulder blouse with dainty embroidery, then consider showing this latest blouse sleeves design image to your tailor! A pattu saree is wholesome and beautiful in itself. But do you know how you can make it stand out from the crowd of kanjivarams? By stitching a blouse that has the latest sleeve design with deer and peacock motifs in maggam work! This bell sleeves blouse is a great choice to opt for georgette or chiffon sarees as the sleeves design is flowy and will give your blouse a better structure! This off-shoulder sheer blouse with spaghetti is a lovely pick to wear with a pastel lehenega for any of your daytime pre wedding fucntions! Deepika’s wedding party in Mumbai saw her wearing this stunner of a Sabyasachi lehenga with full floral embroidery, which also has its blouse sleeves design in the same pattern. Check out more pics here! Try out this hatke blouse sleeves design that is a total contrast to the colour of the blouse. To make it cooler, you can add a patchwork of embroidery too! If you are looking for a blouse sleeves design that ultra-chic and modern, then an off-shoulder pattern with cascading sleeves like this one is a fab option. Did any of these blouse sleeves designs make you want to want to run to your tailor and show him all these for reference?